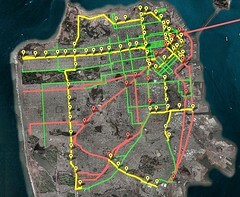 This website has featured a number of posts that experimented with mapping out a more complete and robust rapid transit network for the Bay Area, with a focus on the urban areas of San Francisco and the inner East Bay of Oakland and Berkeley. This page is an organizational home base for those various posts. The maps here focus on San Francisco, Oakland, and Berkeley not only because this region is where most Bay Area transit riders are, but also because the urban core has been sadly neglected while BART has extended and continues to plan future extensions further and further into exurban hinterlands — a trend I would very much like to see reversed, for many reasons. 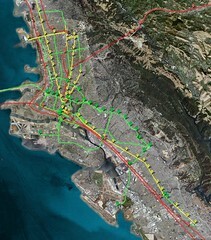 Despite the heading of this page — fantasy transit maps — the maps are based on “real life” considerations, including, to varying extents: ridership patterns both present and anticipated, engineering feasibility, cost, the greater goal of creating a rapid network, and land use/development potential. (One remark: although transit inevitably can become highly politicized, this is often to the detriment of building an effective project — so one factor these maps do not take into account is the inevitable political wrangling that would eventually occur once projects are proposed.) Based as they are on these considerations, the maps are not a complete fantasy, but at the same time, the goal is to present a more expansive long-term vision than what is currently being discussed officially. Depressing though it may be to say, we do want to be upfront about this: at the rate transit projects in the Bay Area are planned and built, some of the proposals in these maps would take, at a minimum, decades to complete. 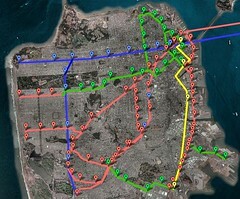 Admittedly, the rail versus BRT division of the maps is artificial and was chosen mainly to simplify map plotting. It is counterproductive and a bit silly to focus on expanding only one transit mode. The best solution is to mix and match, prioritizing corridors and choosing the modes that best serve both present and future demand along those corridors. As such, none of these maps is a complete proposal on its own. The ideal transit fantasy map would really be a combination of the maps presented here, implementing rail in some places and BRT in others.